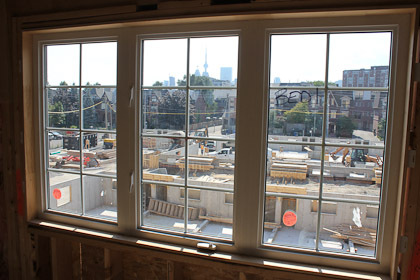 It’s only been a few weeks between updates but we are so excited to bring you progress on Corktown Mews that we couldn’t wait for another month. 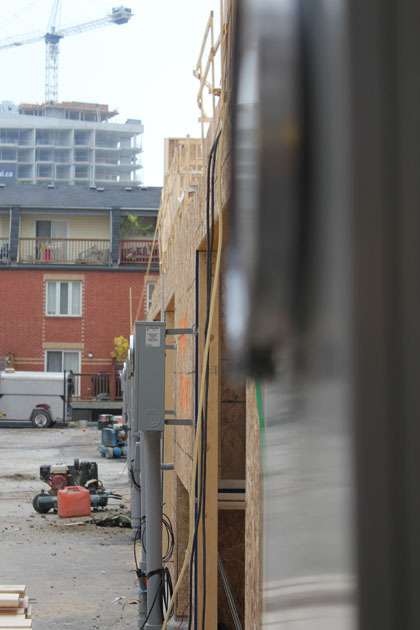 Bricklayers are working away on the facades of some blocks, while workers hammer away at getting the framing up on other blocks. 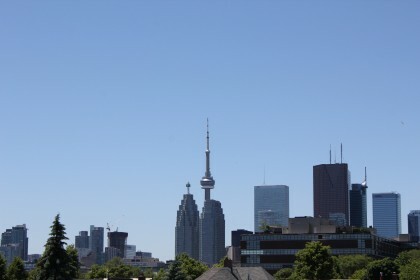 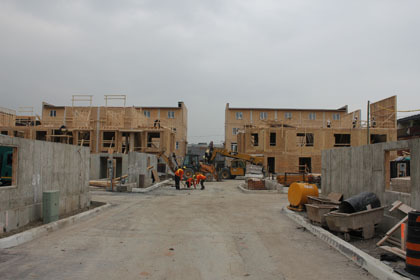 The neighbourhood of Corktown is currently undergoing a rejuvenation before the upcoming 2012 Pan-Am games, which are being held in Toronto. 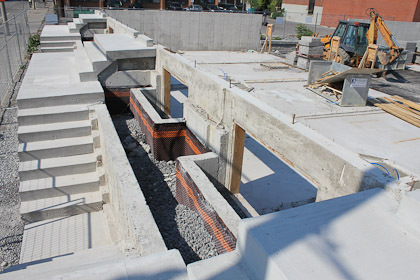 now would be an excellent time to lay down some roots in a very exciting part of the city! 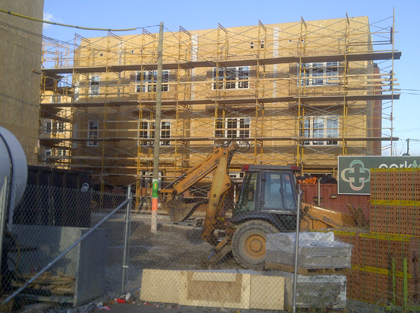 Brickworking scaffolding is being placed around one of the fully-framed blocks. 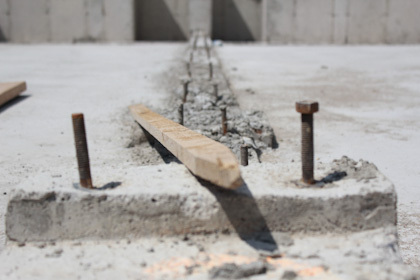 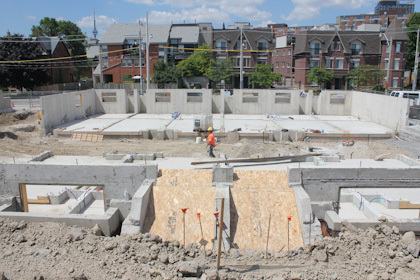 The last of the block’s foundations are in place. 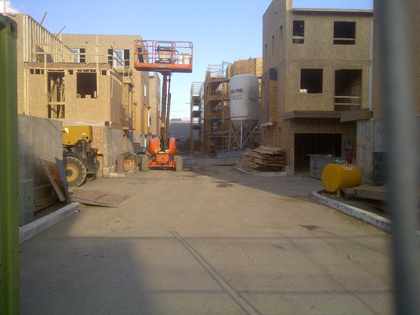 A look down the main entryway into the community. 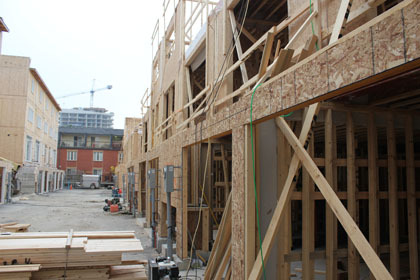 To learn more, or to register for updates regarding our “Corktown Mews” development – Go here now! 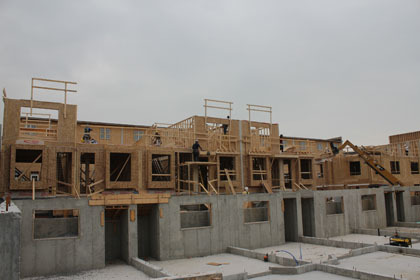 As of this post, there are still 2 units available. 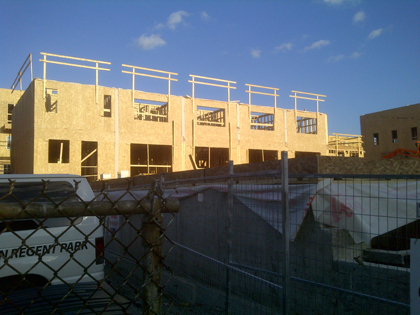 So, what do you think of progress so far? 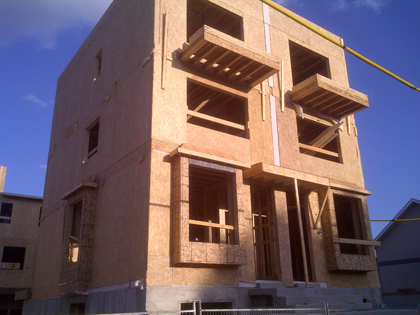 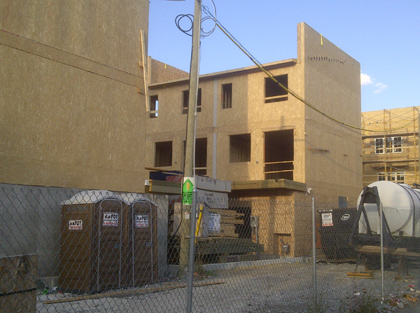 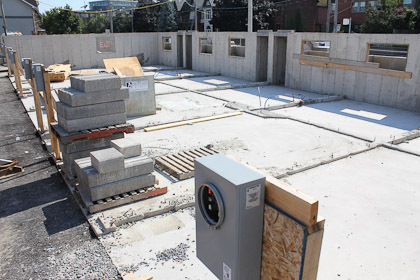 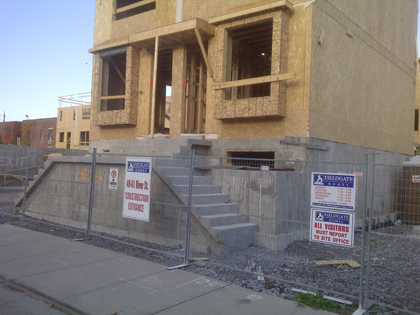 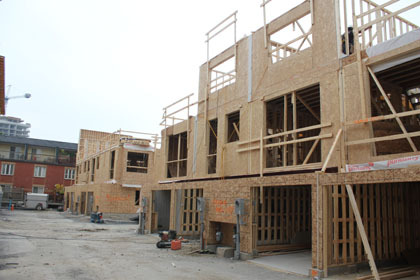 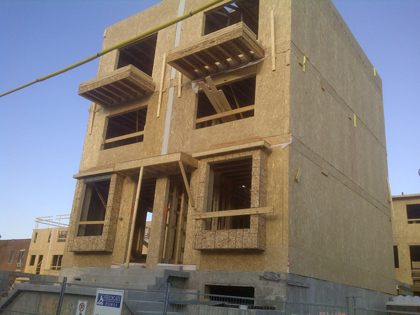 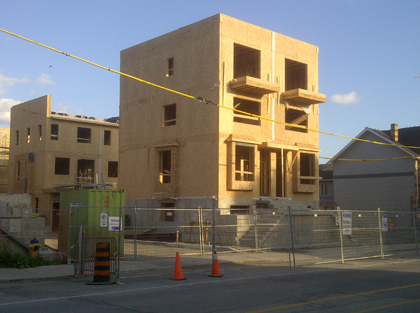 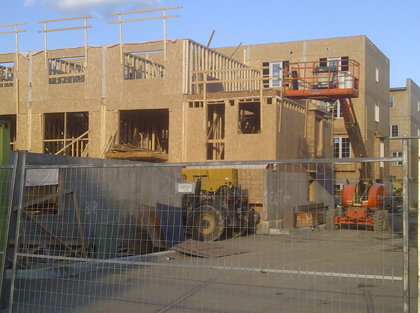 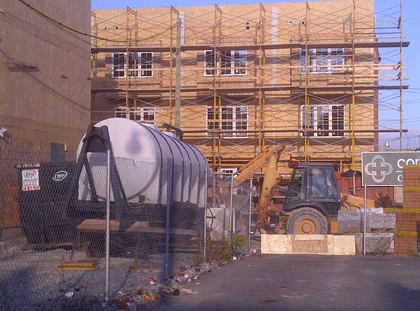 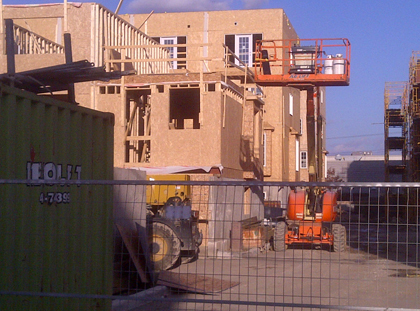 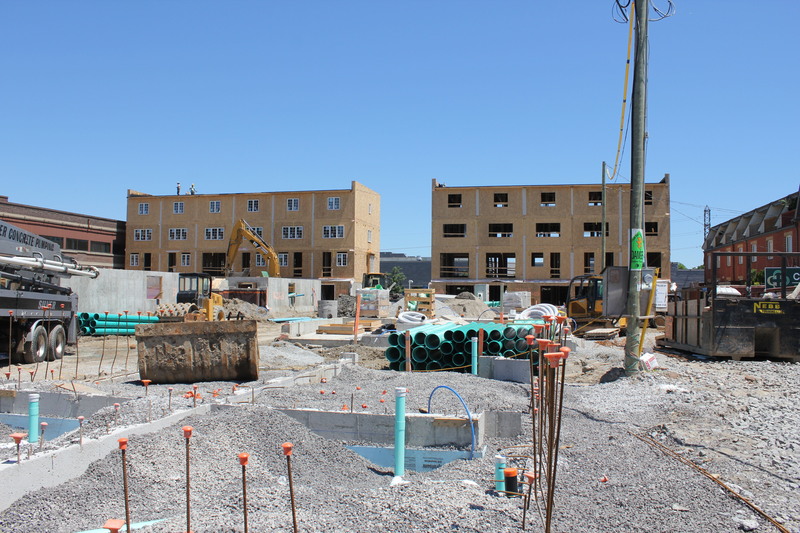 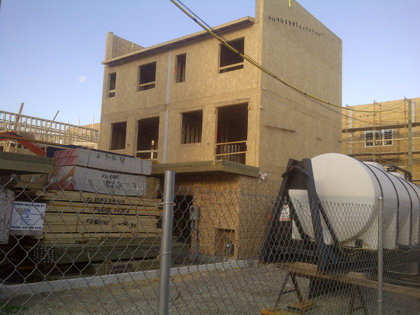 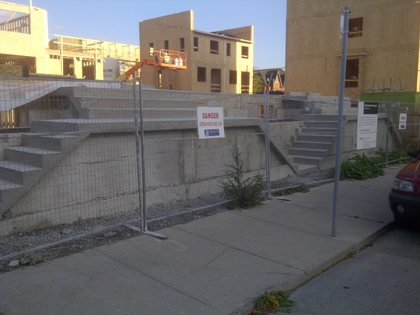 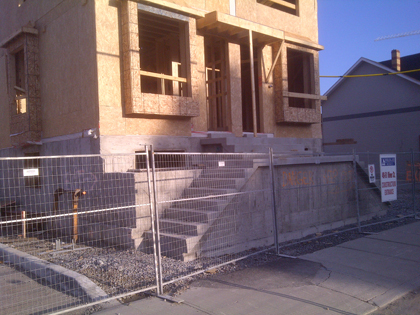 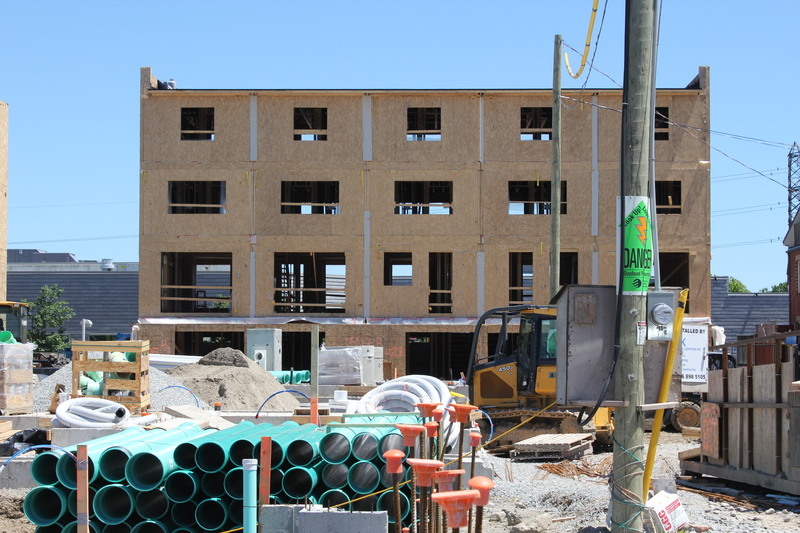 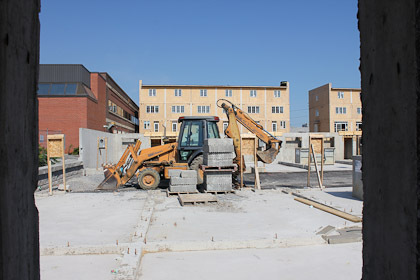 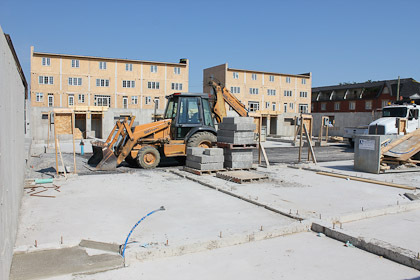 Corktown mews is coming around nicely, all of the blocks are now underway and in various stages of completion. 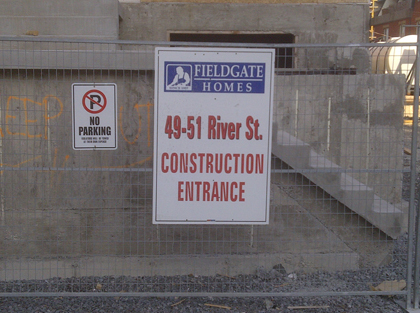 Fieldgate homes took a tour through the neighbourhood to snap a few shots and see the progress since our last update . 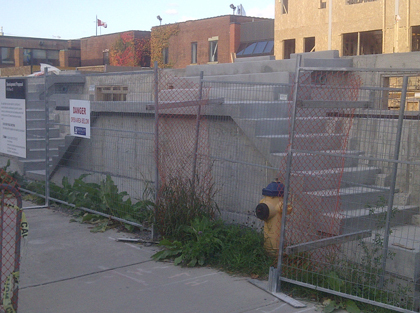 As mentioned, the blocks are in various states of completion at the moment. 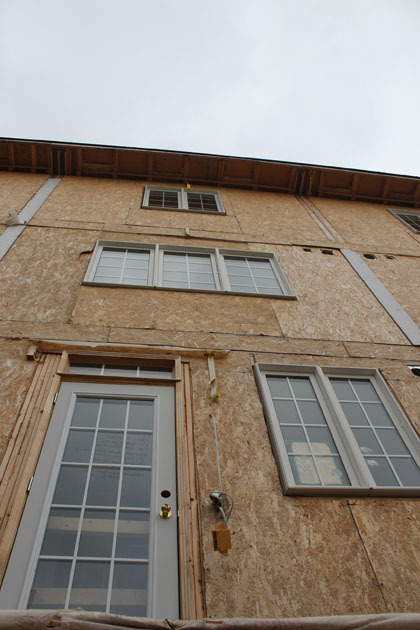 Here we have ones with the first two floors in as well as what looks like some basic electrical work. 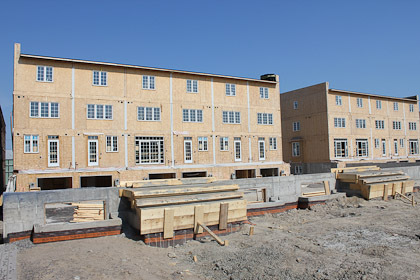 Doors and windows are in on some blocks, and they remain that way until masons can come in and finish the brickwork. 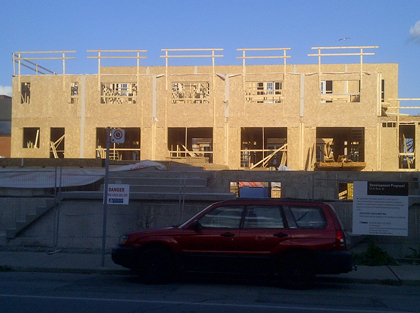 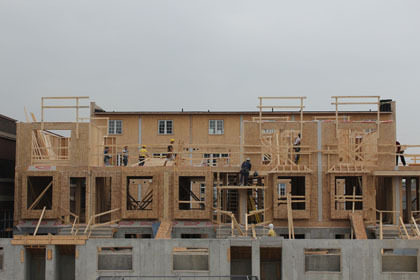 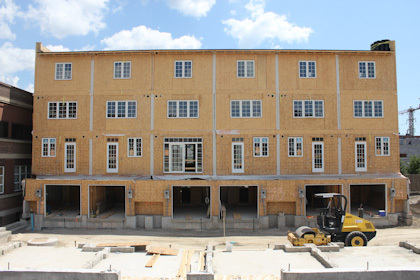 Heres a shot of 3 blocks – Foundation, First floor and Roof – So many levels! 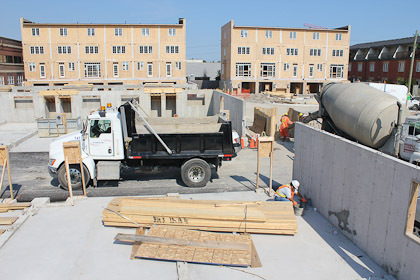 Contracting trucks are pulling up daily to work on many of the tasks that still have to be done at the development. 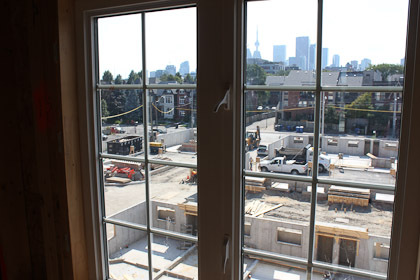 We stopped by our Corktown Mews development in downtown Toronto last week to take a peek and see how things are coming along. 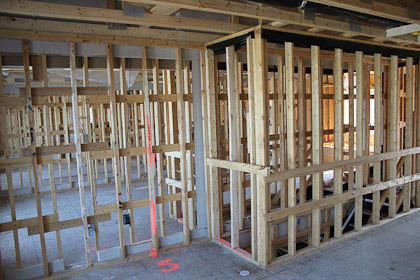 Check out our pictures below in this latest construction update. 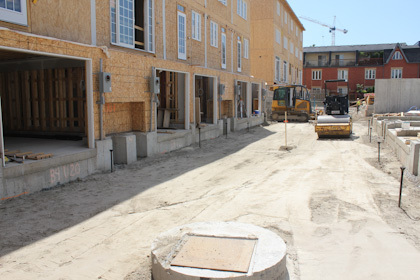 Crews are still working on Hydro/gas/bell/cable trenching at the moment. 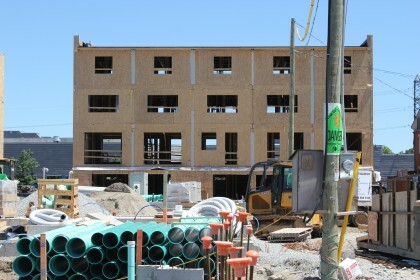 The next big project on site is to begin framing block 3 and 6 next week. 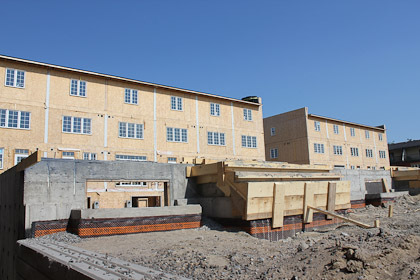 As of this posting there are still 2 units avaialble. 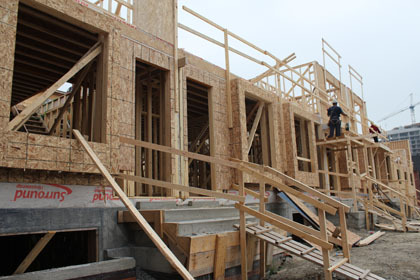 To find out more , Click here! 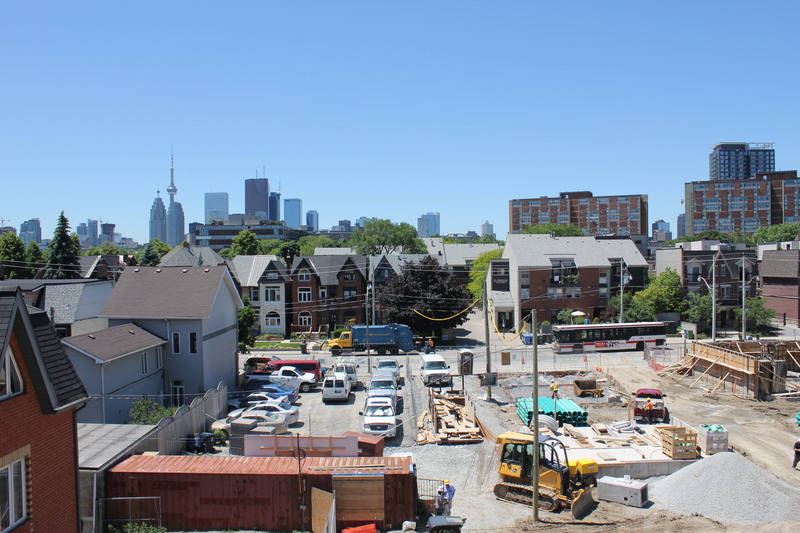 We’ve been visiting Corktown steadily over the past several months to check in on what’s been happening with our Toronto townhomes. 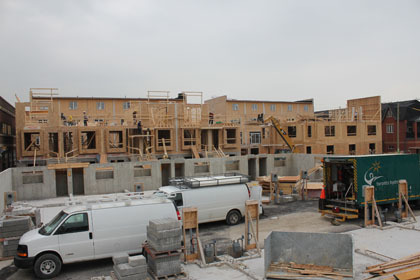 It’s one of our favourite sites to visit as there’s always so much progress to see. 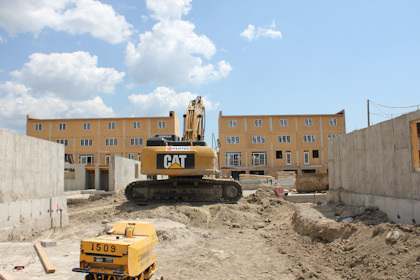 This time, all the sewerage work is complete on site and all 8 residential blocks are well and truly underway, albeit at various stages of completion. 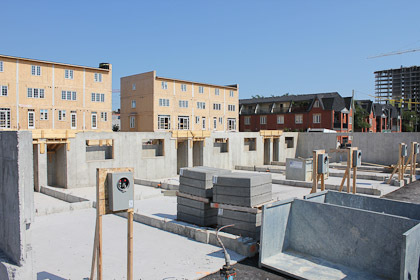 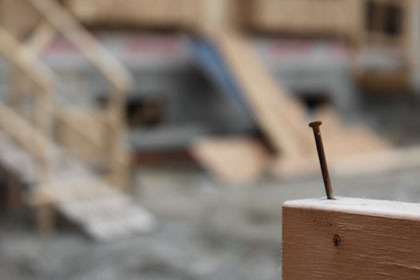 Originally a brownfield site, Corktwon Mews will soon be home to 37 townhomes and will be one of many examples of how the area is one of the next big locations in Toronto. If you haven’t seen our Corktown infographic yet check it out here, and for more photos from the site you can visit our Facebook page. 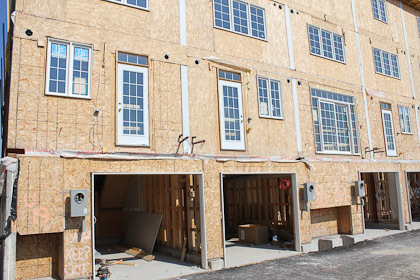 There are still two tonwhomes left to purchase. 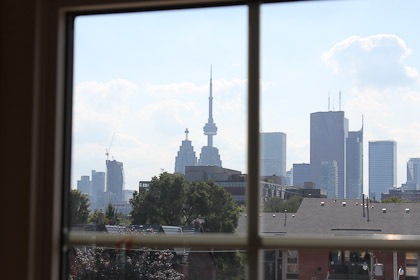 If you are interested, call 416 214 4724. 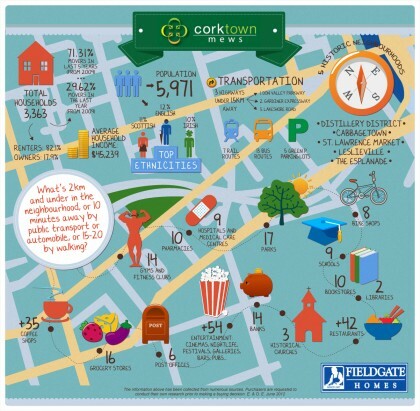 There are tons of amenities in the area, and if you haven’t seen our infographic of the neighbourhood yet, you better click the image below to enlarge.